Two days after the Karnataka Road Transport Office issued a directive to commutech companies against applying surge pricing, Uber and Ola seem to be defying the rules and continuing with higher prices. 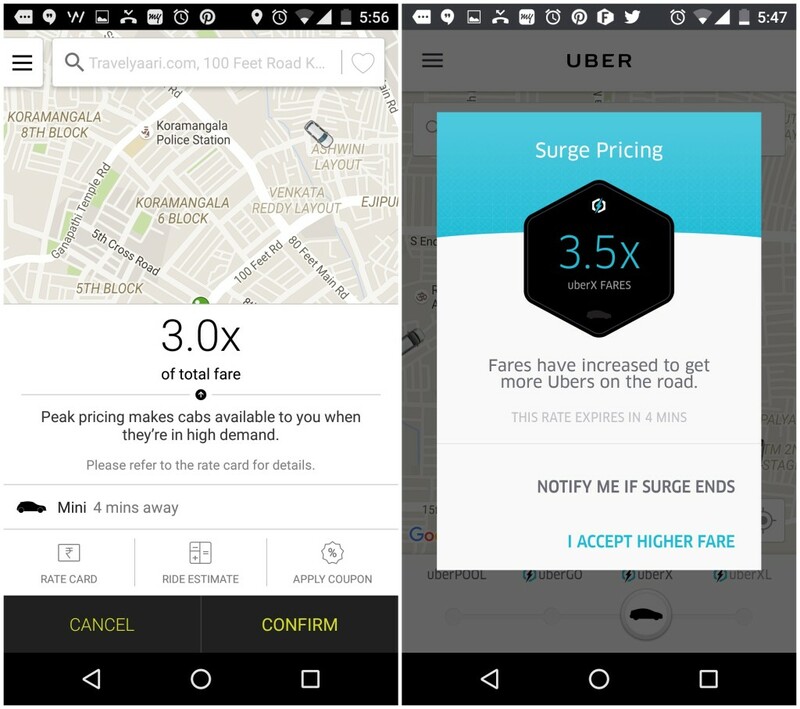 Both Uber and Ola have displayed surge pricing as on Sunday evening with as much as 3.5x the normal fare. Screenshots from Ola and Uber on Sunday evening. On April 3rd, Karnataka became the first state in the country to regulate pricing by commutech companies by issuing a directive against inflationary pricing. Uber and Ola regularly employ surge or peak time pricing to offset its low fares during non peak hours. The move by the government had met with mixed reactions from public. One set of people believed that the ban on surge pricing flies in the face of a sound economic-driven pricing model of demand supply, and that it would eventually hit the customers as fewer cabs will be available. Others, who were regular cab users, had expressed happiness at the decision. But the continuing with surge pricing is getting people in both camps angry. Do you believe that you are above the law? It remains to be seen if Ola and Uber will continue to flout the government rules or eventually toe the line. Uber, especially, is known for finding creative ways around government rules as it battles regulators worldwide. In Bangalore, Uber had continued with its UberMOTO service in spite of a government ban on bike taxi services by rebranding it as a bike pooling service.